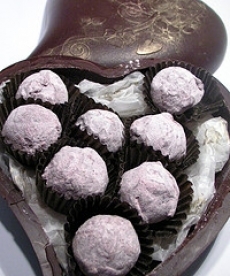 Have you made Champagne Truffles? 1. BRING THE CREAM TO A BOIL and pour it over the cut chocolate. 2. 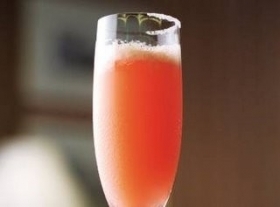 Allow to stand 1-to-2 minutes and stir smooth. 3. Beat in the softened butter and cool to set. 4. Beat with an electric mixer (using a paddle attachment if available) on medium speed until light. 5. Beat in Cognac. Pipe out small truffles on parchment or waxed paper with a pastry bag fitted with a 1/2-inch plain tube. 6. Refrigerate to set. Melt the chocolate. Sift the cocoa into a deep pan. 7. 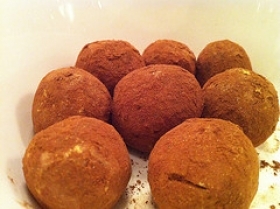 Dip the truffles in the melted chocolate and then deposit them in the cocoa, shaking the pan to cover them. 8. 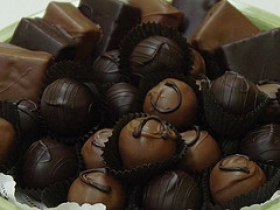 After the covering sets, shake the truffles in a strainer to remove the excess cocoa. This recipe contains potential food allergens and will effect people with Butter, Cocoa Powder, Alcohol allergies.